I’m looking to get a better cover for my G23 while it is on the lift. I currently have the factory cover that came with the boat and I find it does let water get through it and pools in a couple spots under the Bimini. I would like to get something to go over the tower and z5 Bimini while it is in the up position and down to at least the water line. Anyone have any experience with a cover like this? Any pointers good or bad? Would you get another one or go a different route if you had to do it again? I guess my biggest hesitation is the ease of installing it all the time and it is a fairly big investment for a cover, so would I be better to put that money into a different style of cover? Here’s an example of what I’m looking at doing. I have one for my 230. You're right that it's more difficult to install, but like anything you figure out a process and it gets easier. It keeps the tower from getting all jacked up with dirt, webs, etc., and I like the ability to get in the boat without removing the cover at all (it has a zippered opening for access). Yes it's expensive. Who made your cover? What was the cost? I got it through Buxton when I bought the boat. If I recall correctly, it was about $1800. They work with a local shop to have them made. I have an over the tower but I can stow my bimini. Best cover around. The full protection and lack of ponding take the cake. I like the idea of a zippered access for those times I cover the boat the oh crap I forgot my sunglasses or phone or wallet.... Check Sewlong. The may have your pattern. How difficult is it to put the cover on? How does your cover tie or attach to the hull of the boat? I'm trying to determine if I could put it on my boat when it's on the lift in my boat slip. It's definitely more challenging than the standard covers, but not too bad. 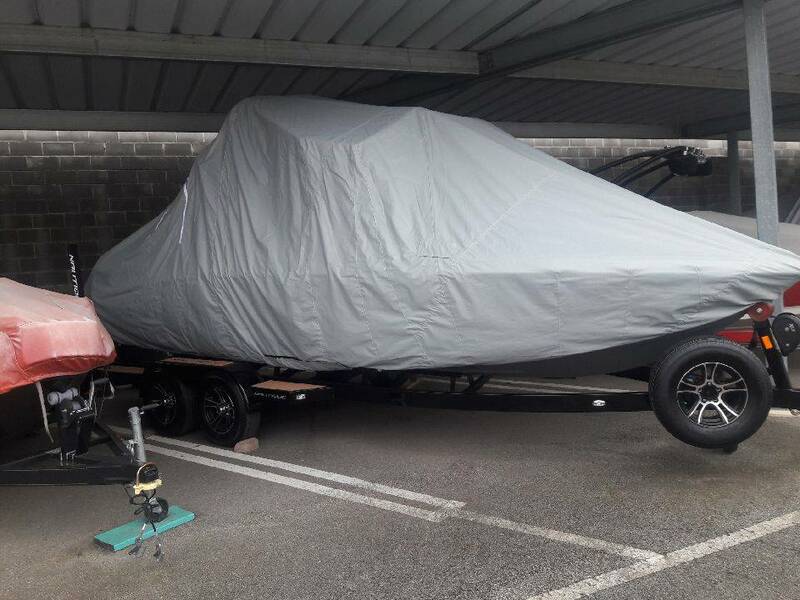 I trailer our boat, so I don't know about covering it on a lift -- however there are a few people at the marina with the same cover on their lifted boats, so it can be done. It is secured to the hull with rartchet straps near the waterline. Last edited by neirbot; 06-11-2018, 10:52 PM. Quick update on this from my end. I ended up getting a cover made for my boat. Went with sunbrella fabric. It will take a little practice to get in the hang of getting it on and off quick, but overall I’m happy with it. Like that it covers up everything all in one shot. Where did you get your cover? Looking for the same thing. The standard in covers should include side skirts. Just make sure its long enough to cover the entire side of the hull. Keeping the sun off avoids continued waxing and sun fade. So, so, so much better than a cover that stops at the rub rail.